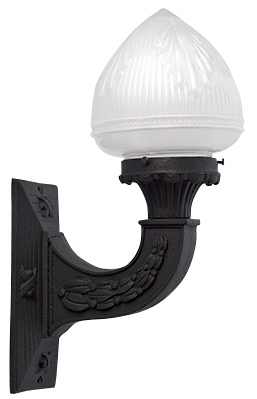 Solid Iron Traditional Outdoor Sconce Light - comes complete with a milk glass style Floral Pattern shade and a vintage style porcelain light bulb fitter. Completely wired and ready to mount. Measures 14 inches tall (with shade) and has a projection of 9 inches. Solid iron construction. 75 Watt bulb maximum.